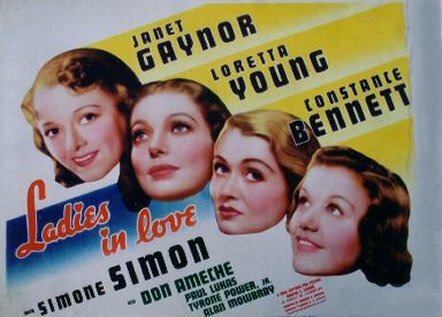 Tyrone Power was seventh billed in Ladies in Love , which was based on a novel by Ladislaus Bus-Fekete. 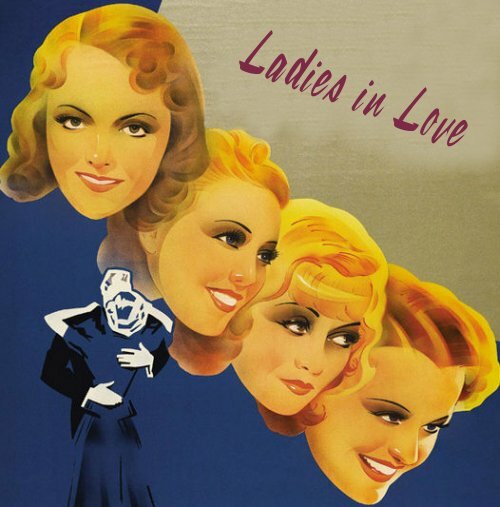 This would be his last time to appear in a minor role and the last in which he was billed as Tyrone Power, Jr. Just one month after the release of Ladies in Love, his first role as the leading man (in Lloyds of London) would propel him into stardom, making him one of the most recognized and adored faces on the screen. This movie was the first of five movies that Tyrone Power and Loretta Young made together. The fans loved the pairing of the two, and they went on to star together in Love is News , Cafe Metropole , Second Honeymoon , and Suez. 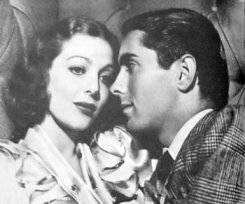 Loretta Young became increasingly unhappy with what she viewed as having the size of her roles cut in order to showcase Tyrone Power, and she left 20th Century Fox in the hopes of furthering her own career. She and Ty remained friends. Janet Gaynor, who was nine years older than Ty, had been a star for many years when this movie was made. As a boy, Ty had been a fan. After Ty became a big star, the two of them became an item in the gossip columns, as they were seen about Hollywood as a couple. The relationship was brief, and, not too long after they broke up, Ty married Annabella. Also appearing in this movie was J. Edward Bromberg, who was previously in Girls' Dormitory with Ty and would be a supporting player in future Tyrone Power films: Second Honeymoon, as Herbie; Suez, as Prince Said; Jesse James, as Mr. Runyan; and The Mark of Zorro, as Don Luis Quintero. Don Ameche, Ty's good friend, played a supporting role in this movie. This was Ty's last time to be billed below Don Ameche or Loretta Young. New York Herald Tribune: "Tyrone Power makes a handsome count." New York Post: "Loretta, a chorus girl, is in love with Tyrone Power, Jr., who is as handsome as everyone seems to think Robert Taylor is."